From Gilles Deleuze’s The Logic of Sense. Ilya Prigogine and Isabelle Stengers in their famous book Order out of Chaos argue that the clinamen, the swerve of events, is one of the fundamental factors in the creation of new, unpredictable patterns of self-organizing in the universe. They call these new patterns of self-organizing dissipative structures. 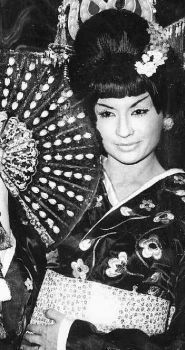 As Luciana Parisi and Tziana Terranova gloss it in an article entitled “Heat Death,” the clinamen is “the smallest angle by which an atom deviates from a straight line…This deviation (clinamen) is the generator of differential energy and matter, an anti-Platonic ontology of becoming.” What is before swerve, clinamen is tendency? A statistically distributed resonance? The aim would be to follow the processes and events of media swerving, resonating, reaching critical thresholds, and generating a new order: a new media assemblage, clinamedia. Clinamedia is the very condition of creativity—the intensive processes of becoming, patterned but unpredictable distributions of singularities and intensities—immanent to the assemblage of bodies, populations, and media flows today. A substance understood purely from its potential to change and repeat. But if we maintain the mostly spatial understanding of the clinamen we risk missing this paradoxically creative and sterile nature of the field of the swerve. 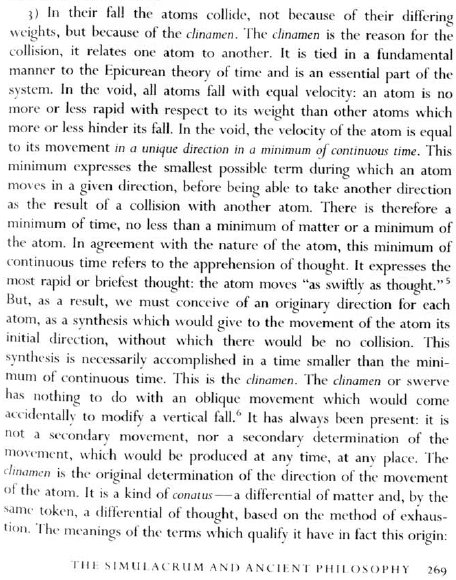 But in “Lucretius and the Simulacrum,” Deleuze wants to correlate the clinamen not with an oblique movement “which would come accidentally to modify a vertical fall.” Rather, the clinamen is the original determination of the direction of the movement of the atom, patterned but unpredictable. A minimum of continuous time, a continuous intensity itself, the clinamen distributes singularities and intensities across a vector field of potential, that which precedes the metric actuals of a given timespace. An imperceptible differential of matter and thought, thought becoming intensive. The clinamen is quasi-causal or non-linear in its surface effects. We could relate this to what is called a quantum fluctuation in quantum mechanics, which is defined as the temporary change in the amount of energy in a point in space. This slight change is precisely the introduction of disorder into a system far from equilibrium, an increase in uncertainty. Another way to model an increase in uncertainty in a non-equilibrium system is as the production of entropy. By correlating the clinamen with quanta we are drawn toward irreversible, intensive processes that introduce a change in nature. But this move runs the risk of reducing the force of this concept to a mock translation into a supposedly analogous tongue, the language of quantum mechanics. What we need to do, on the contrary, is listen to the stammerings of the processes that unfold through a particular coding–quantum mechanics–and its mode of capture. 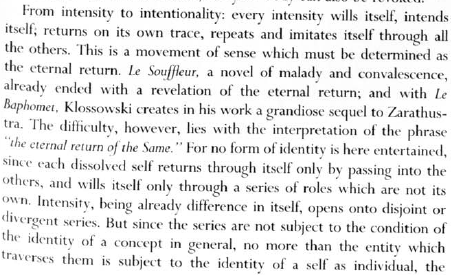 Again, Deleuze extracts other dynamics from the clinamen, particularly as they relate to temporality. Through the clinamen, Deleuze elaborates the “naturalism” of a speculative and practical philosophy. At once counteractualization and effective diagram, such a naturalism necessarily pushes thought to the limits of time, to nested temporal scales, even times that conflict in the sense that Eisenstein meant montage. If taken as a thought of media’s minimum continuous time, a media assemblage’s intensive field must be specified through diagramming strategies of contracting attention in the practices of a given media. But what warrants this translation between the concept of the clinamen and various kinds of media? Why does a media ecologies approach to media history and practice need the concept of the clinamen? What does it do in this field of intervention? In the history of film criticism, for instance, what concepts help us think this field of potential? We must keep in mind that largely this question of potential–which has never been external to this criticism–has been reduced to the potential of the filmic syntagmatic sequence to construct meaning. But there are those moments that the irreducible and prior question of sensation-potential is acknowledged and becomes active. It is useful to keep one word in mind at all times: Style. Bunuel intuits the self-organizing dynamics of media in its larval state: resonant ecologies of images, perception, technology, technique. The resonance is both sterile and productive, a fuzzy set of repetitions that bleed into a collective becoming. Bunuel activated the monadic, vermicular, evolving image, a contagion of movement, a changing functionality for sound (the addition of the score in 1960 to Un Chien Andalou can help us track that change). Conley’s gloss on this is particularly illuminating. He suggests that for Bunuel the “ideal film scintillates where its embryonic unit, the shot, is seen as a segmenation of visual and verbal fragments–images–that amass and explode. A succession of shots is successful when it transforms what was not into what suddenly becomes or is. Far from Hegelian dynamic of an Eisensteinian type of montage, Bunuel’s segmentacion embraces forms that swarm, as might a colony of bees or a mass of worms–vermin–and that give rise to a “vermiculated” whole. A film begins by being a landscape or topography, a surface seen and felt as a mosaic of an almost infinite mass of segments. The pieces, which are of different proportion, conjoin in a single shot, which in itself amasses groups of others. Segmentation makes possible creative metamorphoses” (Conley, “Un Chien Andalou” 203). It is this vermiculation that opens media to other platforms, habituations to mutation, and sensations to the shock of its own synaesthesia. Vermiculation is the process of clinamedia. But Conley moors these processes in vision by turning Andalou into a “film about visibility.” Thereafter, vermiculation becomes merely a metaphor for “one ocular effect [bleeding] into another.” But the movie is not a metaphor for anything, it is something in its own self-organizing capacity, it is vermicular in what it does, not what it could mean. “Emerging from the reflection is heightened sense of the ocular. The eye of the camera is incarnated in the images” (205). If it is true that Bunuel suggests “that no single shot can ever be subordinated to another” then why should we subordinate all the other senses to vision? It is precisely toward a bodily limit of synaesthesia that Eisenstein took cinema, according to Steve Odin, who in an article on “The Influence of Traditional Japanese Aesthetics on the Film Theory of Eisenstein” (Journal of Aesthetic Education, 23:2, 1989, 69-81 [one should carefully interrogate what the mark of the traditional is doing in Odin’s essay, what collusion it hides or reveals]), wrote that Eisenstein believed that the aesthetic education acquired through the study of Japanese culture results in a heightened awareness of interrelationships between sights and sounds, culminating in the multisensory experience of synaesthesia. Now it is this vermicular synaesthesia that we have been elaborating through the concept of clinamedia. Odin’s essay is useful in that regard by showing that a very different conception of the function of montage on the perceptual apparatus was active in Eisenstein’s work. This function was not merely dialectical but actually larval and viral in its processes of becoming. It suggests something more: the dialectic in Eisenstein’s work is a principle of shock, provocation, and connectivity (consider his use of Kabuki-style transitionless acting in the Odessa Steps scene). The shock returns the body to its mutational tendency as it connects multiplicities across the machinic phylum. On the one hand, we cannot simply ignore or pass over the specific tone of engagement in relation to Japan. If Japanese artists had a given instinctive practice, Eisenstein would never have had the occasion to complain of a lack of montage in Japanese film. Nor can his injunction to be more “Japanese” to these film makers simply be interpreted as an innocuous, if ironic suggestion from one “colleague” or “comrade” to another (see “The Cinematographic Principle and the Ideogram”). On the other hand, we see Eisenstein clearly trying to find a transcultural dimension of Japanese aesthetics, and he finds it in the principle of provocation (what, following Benjamin, I would call shock). But our concern is to restore to the diagrammatics of media assemblages the intensive processes that constitute its various becomings, virtual and actual. The clinamen in media: clinamedia. It is useful then to keep in mind the Leibnizian formulation of ” a single monistic sensation of theatrical ‘provocation’.” A resonant, open, far-from-equilibrium unity in the process of connecting with perception. This is crucial because the synaesthetic effect of kabuki or haiku should be seen as a static synthesis (the danger of some of Odin’s arguments), but as partly a random but structured, enduring correlation of trajectories and tendencies unfolding. Synaesthesia is the coupling of perception to the underlying “noise” of the body. “The shot is then a montage cell. Consequently we must also examine it from the point of view of conflict. Conflict within the shot is: potential montage that, in its growing intensity, breaks through its four-sided cage and pushes its conflict out into montage impulses between the montage fragments; just as a zigzag of mimicry flows over, making those same breaks, into a zigzag of spatial staging…If we are to compare montage with anything, then we should compare a phalanx of montage fragments–‘shots–with the series of explosions of the internal combustion engine, as these fragments multiply into a montage dynamic through ‘impulses’ life those that drive a car or tractor. Conflict within the shot. It can take many forms: it can even be part of…the story” (Eisenstein, “Beyond the Shot” FTC 19). Shot-image: A montage embryo, something inert, but brought to life by the flows in which it is embedded. It would be wrong, then, to conclude that the pleasure of vermiculating cinema, its specific swerve, is of representation rather than the processes of its accomplishment. Aristotle writes, “….everyone delights in representations. An indication of this is what happens in fact” we delight in looking at the most detailed images of things which in themselves we with pain, e.g. the shapes of the most despised animals even when dead. The cause of this is that learning is most pleasant, not only for philosophers but for others likewise (but they share in it to a small extent). For this reason they delight in seeing images, because it comes about that they learn as they observe, and infer what each thing is, e. g. that this person [represents] that one. For if one has not seen the thing [that is represented] before, [its image] will not produce pleasure as a representation, but because of its accomplishment, colour, or some other such cause” (Poetics, Norton Anthology 93). Now Aristotle of course begs the question of the relation between representation and its accomplishment (intensive processes). I am inclined to argue that a representation is first of all the accomplishment of processes embedded in material practices, and only later gridded with a representational schema. We will return to this distinction throughout these postings. And what to do as my body is falling apart? Pain wracks through me, joints ache, and muscles are tender and sore. This is coupled with a intermittent jolt in my stomach of something completely lost and still wanting. Yes, yes we write because we mourn. In the practice of writing the mourning seems to go away, or it enters my body again. But it has never left me this mourning. Cinema entered this world in the colors of mourning, says Godard in Histoires Du Cinema: Une Histoire Seule (1989). Mourning cinema. I feel something dissolve every now and again in the small of my back, and shoot through me suddenly. Like a reminder. In Shunryu Suzuki’s Zen Mind, Beginner’s Mind (Delanda’s scepticism regarding the poor mathematization of 60’s era Buddhism not withstanding–see: I recall passages describing the pain of the body in Zen practice, and that feeling pain is good, and of course wondering what simple practice I had missed. But the implication here is that to be alive is to be in pain, and it is in this life-pain, when we make the problems ourselves, our bodies, that we find Buddha in each repetition of a practice constantly reassembled through right posture and concentrated breathing. For his part, Delanda does note the potential for progressive self-differentiation in the practice of yoga samadhi. In any case, I feel like such a dolt in the face of Zen, but then there is always hope for the worst horse, as they say. For Deleuze, “Intraworld bodies have also at their disposal a principle of reproduction. They are born, in fact into already complex settings, each one of which gathers a maximum number of elements of the same shape: earth, sea, air, ether, the magnae res or great strata which constitute our world and are connected to one another through imperceptible transitions. A determined body has its place in one of these realms. As this body loses endlessly the elements of its composition, the realm in which it is immersed offers it new ones…” (Logic of Sense 271-72) This is a properly ecological understanding of the nature of things: emergent properties produced through the interaction of resonant multiplicities. As should also be clear there is an ethics to this thought as well; if the realms in which a substance is immersed offers a set of force-relations that push or induce a bifurcation at a critical ridge of intensity, those bifurcations often threaten the very continuity of the substance itself. We could say that those critical ridges that pre-empt substance from achieving a certain homeostasis in its progressive self-differentiation will always come as a kind of shock. There are times when such shocks are salutary, other times not so much. It is an ethics which instead of life is oriented around a notion of life-in-death. Deleuze goes on to point out that for Lucretius the body is both seed and womb, when the body finds those feedbacked vectors through which it resonates and ramifies it finds its own quasi-cause, but as in Zen it is nothing, just an affirming practice of minute transitions. That is all. The quasi-cause is practice-found, that we come to it, to the diagram of what to do with it, not mean with it, but here is the meaning as well, in a difference of repetition, in the continuous unfolding of the repetitions that constitutes an intensity. But what is this practice-found? There is no one practice, there are sets of heterogeneous practices which can help in modeling the forces and dimensions of change in a given domain of intervention. Because each domain can change in multiple ways, we need to model that which gives a domain a relative univocity, a multi- or trans-causal resonance within a distributed field. Deleuze explicitly ties the clinamen to a thought of causality and causal series: the clinamen manifests the impossibility of bringing causes together into a whole. The clinamen is the principle of divergence within multiplicities. To make differences diverge then, in a “stuttering practice of an ontology of becoming” (Dorothea Olkowski, Gilles Deleuze and the Ruin of Representation 14). Olkowski suggests that for Deleuze, philosophy is “stuttering. Stuttering is what happens in language when the language system is in motion, in ‘perpetual disequilibrium,’ so that the entire language system stutters, murmers, mumbles and breaks up in a heterogeneity of time and space” (14). To stutter, to stammer in practice and in language is to disrupt a given flow and to follow creation into a completely foreign tongue. In the stutter the untimely is suspended and unfolds eternally. The eternal return as eternal divergence of intensive vector space, topological and diabolical, to this we raise all toasts, this is what we affirm by our practice, which is nothing, nothing special. “The true subject of the eternal return is the intensity and singularity; the relation between the eternal return as actualized intentionality and the will to power as open intensity derives from this fact.” Intensity for it to maintain itself must be repeated, that intention must go over its own trace, and in so doing open itself for a minimum of continuous time to the clinamen. Every betrayal of emotion or supposed wound to the ego or sacrifice of/to love and the distribution of their dynamics of desire–these too are all embedded in this distribution of intensities and singularities. Every one of these events concatenates, resonates, ramifies through the whole field, and this process of qualitative change, the duration, de/stabilization of change in nature is what repeats endlessly. No division between Being and Becoming here: being is divergence itself. It is this sensual distribution of intensive vectors and singularities that we would want to draw out from the Helen assemblage, the ecology of sensation specific to these effects. The minimum of continuous time that distributes matter and thought through the movement of her scenes, the tendencies embodied and expressed through her movements. The Helen assemblage seems particularly apt for classical Bollywood cinema because in her dance sequences film makers were able to bring together two pre-eminently cinematic subjects: the chase and the dance. Here it is useful to recall Siegfried Kracauer’s famous theses on movement in “The Establishment of Physical Existence” from Theory of Film (FTC 303-313). “‘The chase,’ says Hitchcock, ‘seems to me the final expression of the motion picture medium.’ This complex of interrelated movements is motion at its extreme, one might almost say, motion as such–and of course it is immensely serviceable for establishing a continuity of suspenseful physical action” (FTC 304). As for dance, Kracauer dismisses all attempts at “canning” dance, and insists that “Dancing attains to cinematic eminence only if it is part and parcel of physical reality. Rene Clair’s early sound films have been judiciously called ballets. True, they are, but the performers are real-life Parisians who just cannot help executing dance movements when going about their love adventures and minor quarrels….What dancing there is, seems to occur on the spur of the moment it is the vicissitudes of life from which these ballets issue” (304-05). Now, we should keep in mind that the most common Bollywood dance sequences of the late 1950s and 60s brought together elements of the chase, elements of “canning,” and elements of dance-in-life. In the mise-en-scene of the Helen cabaret, there was the intrigue of gazes between protagonist and villain, between police and criminal, and between lovers. It is in this circulation of gazes, bodies, music, and movement, that a resonant ensemble emerges and that leaves room for, indeed, is enabled by the clinamen. We will have occasion to return to the chase and the dance, but for the moment we will move on to questions of truth and perception. Neitzsche: “…he needs to make peace and strives accordingly to banish from his world at least the most flagrant bellum omni contra omnes. This peace treaty brings in its wake something which appears to be the first step toward acquiring that puzzling truth drive: to wit, that which shall count as “truth” from now on is established. That is to say, a uniformly valid and binding designation is invented for things, and this legislation of language likewise establishes the first laws of truth. For the contrast between truth and lie arises here for the first time” (“On Truth and Lying in a Non-Moral Sense”). Friedrich Nietzsche grounds language firstly in perception itself. The body assumes center stage with Nietzsche in a way that resonates with Benjamin and Cixous and Kristeva. “Only by forgetting this primitive world of metaphor can one live with any repose, security, and consistency: only by means of the petrification and coagulation of a mass of images which originally streamed from the primal faculty of human imagination like a fiery liquid, only in the invincible faith that this sun, this window, this table is a truth in itself, in short, only by forgetting that he himself is an artistically creating subject, does man live with any repose, security, and consistency. If but for an instant he could escape from the prison walls of this faith, his “self consciousness” would be immediately destroyed. It is even a difficult thing for him to admit to himself that the insect or the bird perceives an entirely different world from the one that man does, and that the question of which of these perceptions of the world is the more correct one is quite meaningless, for this would have to have been decided previously in accordance with the criterion of the correct perception, which means, in accordance with a criterion which is not available. But in any case it seems to me that “the correct perception”-which would mean “the adequate expression of an object in the subject”-is a contradictory impossibility. For between two absolutely different spheres, as between subject and object, there is no causality, no correctness, and no expression; there is, at most, an aesthetic relation: I mean, a suggestive transference, a stammering translation into a completely foreign tongue-for which I there is required, in any case, a freely inventive intermediate sphere and mediating force.” It is this stammering that returns us to Deleuze’s notion of the stutter. Of first importance, then is how Nietzsche defines perception. Anticipating our reading of Bergson, we can say that for Nietzsche perception is a process of subtraction: that from the swarm and flow of sense perceptions the image that emerges subtracts from the flow what humans need to act. We forget this subtraction through what Alfred North Whitehead will call some years later, the fallacy of misplaced concreteness. We assume that there is concreteness in perception, when in its practice it is constituted by a subtracting out what is necessary for action. The error of imaginary causes. To begin with dreams: a cause is slipped after the fact under a particular sensation (for example, the sensation following a far-off cannon shot) — often a whole little novel is fabricated in which the dreamer appears as the protagonist who experiences the stimulus. The sensation endures meanwhile as a kind of resonance: it waits, so to speak, until the causal interpretation permits it to step into the foreground — not as a random occurrence but as a “meaningful event.” The cannon shot appears in a causal mode, in an apparent reversal of time. What is really later (the causal interpretation) is experienced first —often with a hundred details that pass like lightning before the shot is heard. What has happened? The representations which were produced in reaction to certain stimulus have been misinterpreted as its causes. In fact, we do the same thing when awake. Most of our general feelings — every kind of inhibition, pressure, tension, and impulsion in the ebb and flow of our physiology, and particularly in the state of the nervous system — excites our causal instinct: we want to have a reason for feeling this way or that — for feeling bad or good. We are never satisfied merely to state the fact that we feel this way or that: we admit this fact only — become conscious of it only — when we have fabricated some kind of explanation for it. Memory, which swings into action in such cases without our awareness, brings up earlier states of the same kind, together with the causal interpretations associated with them — not their actual causes. Of course, the faith that such representations or accompanying conscious processes are the causes is also brought forth by memory. Thus originates a habitual acceptance of a particular causal interpretation, which, as a matter of fact, inhibits any investigation into the real cause — it even excludes it. The psychological explanation: to extract something familiar from something unknown relieves, comforts, and satisfies us, besides giving us a feeling of power. With the unknown, one is confronted with danger, discomfort, and care; the first instinct is to abolish these painful states. Our very conception of the self is based on the comfort of this misplaced concreteness. Instead if we turn to the becomings, differences, processes that constitute the durations or time of perception—a leaf today experienced cannot be the same leaf experienced tomorrow or yesterday—we find that the self, subjectivity, the sovereignty of the subject has been unwittingly erected on flowing water, i.e. time. And that a perception which might have been effective for a given duration, ceases to be effective, which immediately removes perception from within the purview of truth: a wasp’s eyesight co-evolved with the changing colors of the orchid, because this changing perception of color for the wasp was conducive to its survival. Finally, and most importantly for Nietzsche—and this ties together with the celebration of the Dionysian in The Birth of Tragedy—our relation to perception can only be an aesthetic translation: the drive toward metaphor at its most productive is the drive toward art. The drive toward the formation of metaphors is the fundamental human drive, which one cannot for a single instant dispense with in thought, for one would thereby dispense with man himself. This drive is not truly vanquished and scarcely subdued by the fact that a regular and rigid new world is constructed as its prison from its own ephemeral products, the concepts. It seeks a new realm and another channel for its activity, and it finds this in myth and in art generally. This drive continually confuses the conceptual categories and cells by bringing forward new transferences, metaphors, and metonymies. It continually manifests an ardent desire to refashion the world which presents itself to waking man, so that it will be as colorful, irregular, lacking in results and coherence, charming, and eternally new as the world of dreams. Indeed, it is only by means of the rigid and regular web of concepts that the waking man clearly sees that he is awake; and it is precisely because of this that he sometimes thinks that he must be dreaming when this web of concepts is torn by art. Would it be so bad to dispense with the human? I suggest that everything that Nietzsche argues tends toward that dissolution of man, the human, the anthropomorphic center of a subtractive perception. What are the practical implications of Nietzsche’s thought for cultural production? If perception is anthropomorphic and subtractive, part of what it means to think critically is to think outside the received and habitual categories of perception, and to turn to the changing durations of the flowing water we are unconsciously swimming through. To dispense, then, with the fallacy of misplaced concreteness, by thinking rigorously about becoming and time, and the context specific durations of the concepts we assume are firm, but are in fact historical, the durations of our perception and memories. In other words, to become critical of the differences between our metaphors and the becomings that they are thought to perfectly condense. To think is to think of difference, to make differences in thought. Beware of metaphors. Deleuze once said that metaphors are what we use when we have forgotten how to act. All language is a translation of perception into metaphor. But what it means to create will never not also be metaphoristic, but the metaphor, as N suggests, should not aspire to the full adequation of concept to reality but rather a stammering translation into a completely foreign tongue—in other words, art should be a translation of perception into new processes which themselves become intensive. This is a review of Luca Trevisani, “PINKSUMMER” exhibit in GENOA, ITALY in 2006. (Alessandra Pioselli. Artforum. New York: Nov 2006. Vol. 45, Iss. 3; pg. 310-12; trans. Marguerite Shore). According to Epicurus, the essence of things resides in atoms, which, infinite in number, move in infinite space. Their eternal movement is not a simple dispersion, but rather a fall, subject to a slight swerve, or clinamen. It is this eventual deviation from the straight line that allows them to accumulate. “Clinamen” is the title of Luca Trevisani’s exhibition, which comprises five pieces from 2006, including a video of the same name. Shot on a skateboard ramp, it shows a series of ice spheres that roll down, bump against each other, break apart, and melt .is they follow the ramp’s path. Trevisani seems to choose shots that transform the space into a pure intersection of rationalist lines, but with the ambiguity of a de Chirico-esque metaphysical piazza. Accumulation and proliferation are two recurring concepts in Trevisani’s work-metaphors for thought processes that proceed according to an impenetrable and nonlinear logic, in continuous development and transformation. In the interview printed in the gallery press release, the artist states that he is interested in the liberation of energy: in the expansion of material and in the passage from one physical state to another-ice, water; solid, geometric form and unstable liquid; in light and in time. Gibbosa e sfuggente (Lumpy and Elusive) is a pair of nylon spheres, velvety to the touch, which illustrate the phases of the moon. Partirei dall’acqua (I Would Start Out From the Water) is a sphere made of resin. The transparent material captures the light, and inside the sphere is an hourglass. Trevisani’s thought finds expression in his precise formal research and in the warmth of the sensitive, soft material. Lo Savio’s Halfpipe and Du soleil, de la lumière, des spheres, de la glace (Of sun, light, spheres, ice) are both sculptural pieces with tactile and seductive surfaces in resin and paraffin. Both are reworkings of the architectural and spatial relationships of the skateboard ramp, through a process of formal analysis. The vertical slope of the two mini-ramps, down which streams of paraffin and gel slide (Lo Savio’s Halfpipe), has a counterpart in the irregular void carved into a shiny cube, in the second piece, which, in a single mark, synthesizes the curvilinear wave of the ramp and that of the model for Francesco Lo Savio’s Maison au soleil, 1962, From which it was cast. Lo Savio, in his conceptual investigation of pure, minimal forms, from 1958 to 1963 explored the relation between form and light, considering the former as a device for making the latter visible and seeing the work as a process in a state of continual change. Again in the interview, Trevisani provides a clue, saying that the light and dynamism in Lo Savio’s works fascinate him on account of their musicality: “Because it has to do with understanding the life of matter, and existence in general, as a continuous flux, made by pulsations of different intensities.” Emotion may have been banished in favor of a conceptual approach in the work of this twenty-seven-year-old artist, but, as he reminds us, it is in the mobile versatility of the idea turned into form and material that existence comes to life. Broadly speaking, the term “dissipative structures” refers to structures which are maintained at the expense of energy flowing into the system from the outside. Typically, the description of such systems consists of a set of nonlinear (algebraic or differential) equations involving one or more parameters. Put another way a dissipative structure is a thermodynamically open system which is operating far from thermodynamic equilibrium in an environment with which it exchanges energy, matter and/or entropy. Simple examples include convection, cyclones and hurricanes. More complex examples include lasers, Bénard cells (are convection cells that appear spontaneously in a liquid layer when heat is applied from below), and at the most sophisticated level, life itself. As we know, the most important and interesting processes in Nature are irreversible, that is they break time symmetry because they involve an irreducible stochastic element, in other words, a patterned but unpredictable swerve. Irreversible processes of evolution are riven by the Clinamen. A good example is provided by living organisms which consume chemical energy in the form of nutrients, perform work and excrete waste as well as give off heat to the surroundings without themselves usually undergoing radical changes; such living dissipative systems represent what is called a stationary or steady state. The great contribution of Ilya Prigogine to thermodynamic theory was his decisive shift to the dissipative dynamics in systems which are far from thermodynamic equilibrium. Prigogine demonstrated that a new form of ordered, but stochastic structure can exist under such conditions, and he used the term “dissipative structures” to stress that they only exist in conjunction with their environment. In other words, dissipative systems are dynamically interfaced with their ecologies. “Nobel Prize in Chemistry, 1977,”http://nobelprize.org/nobel_prizes/chemistry/laureates/1977/press.html, accessed 11-11-07. The most well-known dissipative structure is perhaps the so-called Benárd instability. This is formed when a layer of liquid is heated from below. At a given temperature heat conduction starts to occur predominantly through convection, and it can be observed that regularly spaced, hexagonal convection cells are formed in the layer of liquid. This structure is wholly dependent on the supply of heat and disappears when this ceases. Quite generally it is possible in principle to distinguish between two types of structures: equilibrium structures, which can exist as isolated systems (for example crystals), and dissipative structures, which can only exist in symbiosis with their surroundings. Delanda talks movingly, yes movingly–what to do about Delanda’s style? there must be an untimely experience here as well–of the virtual; he writes, “The modelling process begins with a choice of manifold to use as a state space. Then from experimental observations of a system’s changes in time, that is, from actual series of states as observed in the laboratory, we create some trajectories to begin populating this manifold. These trajectories, in turn, serve as the raw material for the next step: we repeatedly apply the differentiation operator to the trajectories, each application generating one velocity vector and in this way we generate a velocity vector field. Finally, using the integration operator, we generate from the vecotr field further trajectories which can function as predictions about future observations of the system’s states. The state space filled with trajectories is called the “phase portrait” of the state space.” The aim here is to treat analyses of media assemblages as “phase portraits.” There are many approaches to this question, but perhaps we could begin by saying that it is a matter of scale. There is this wonderful phrase in Zen the sense of which is that one’s practice of Buddhism should be one long unbroken unbalancing, a long, uninterrupted mistake. In Zen, of course, this means that one is always correcting one’s practice, because one is always drawn toward that asymptotic attractor, the ego, the substantive self, the spatialized self. But we need spaces that diagram potentiality, the vector field of identity. Concomitant with this economic shift in India was the regionalization of politics toward what commentators have called vernacular modernities, where people live in the world of the local language and in its media, and follow whatever variously constructed “traditional” customs suit them, but also negotiate aspects of Western modernity, such as computer engineering or agrobusiness. This suggests that modernity is not a line of development, but a gradient of non-linear forces, that birfucate and undergo phase transitions. There is phrase that captures this self-organizing economic dynamic: patterned but unpredictable. In terms of the political economic variables that cannot be reduced the positionality of the already known, we should not forget that India continues to grapple with at least three armed insurgencies each with very long histories and substantive critiques of Indian modernity: The Kashmiri (Pakistan-influenced) insurgency for democratic rule; the Assamese rejection of centralized Indian nationalism; and of course the ongoing Naxalite-Moaist movement for rural power, land, and resource redistribution in parts of eastern and southern India. Further, the past twenty years has seen the introduction of new economic gradients centered on global financial practices, information technologies, and a service economy displacing an agricultural one. These economic gradients have also meant that there is a re-potentialization, an intensification, and new critical thresholds of sun- and water-based energy flows throughout India’s new ecology of capital. Thus, on the one hand, the harvesting of sun and water energy have become subservient for the first time (beginning around 2000) to the harvesting of information-energy. 1. In terms of the postitionality of the already known see Massumi, Introduction to Parables of the Virtual. 2. In terms of the shifts in economic gradients, and the emergence of new forms of energy exploitation see Cities as Dissipative Structures, Manual Delanda, War in the Age of Intelligent Machines, and A Thousand Years of Non-Linear History. What is a history of media assemblages/ecologies? Take the example of race and colorism in Hindi-Urdu Cinema. This is a draft of a paper I delivered at the Duke University Public Policy Institute in a “Work in Progress” conference held jointly with UNC. The analysis of cinema becoming media suggests to us a method of diagramming mutations of perception. I argue, then, that first and foremost Bollywood has been a mode of mutation for everyday life in India and its diaspora. This would be to think Ashish Nandy’s notion of popular film as the slum’s eye view of the world with Brian Massumi’s notion of perception before experience. Habits come in populations, media come in events. Posed another way: Film media mutate perceptions through representations and habits of consumption across diverse populations. In India, these representations and habits have contributed to the formation of what we might call borders and interfaces between populations, technologies, and transnational spaces. In other words, Bollywood has itself been a racializing technology, in its representations, themes, images, dances, and songs, and, as importantly, in its habits of consumption, its technologies of presentation, exhibition, and circulation, or what I call more broadly Hindi-Urdu media’s ecology of sensation. Second, I contextualize the questions of race and colorism in terms of a few broad historical transformations. The first is the fairly rapid dissolution of the Nehru-era hegemony of the Congress centered on secularism, socialism, and nationalism. This refers to the rise of liberalization as state industrial and agricultural policy in the 1980s, and globalization as cultural practices centered on the consumption patterns of a growing middle class since the mid-1990s. So the sense of what India’s borders are in terms of a national imagining has shifted over the past thirty years as transnational capital has transformed India’s relationship to the modernities of globalization, which is to say simply that race and racialization today is inseparable from practices of consumption. There were many causes and historical conjunctures that led to the dissolution of the Nehru-Gandhi hegemony. For instance, the green revolution which gave rural-based populism new political and economic power, and which also had repurcussions in terms of the financial structure of popular cinema. I am interested in Helen, the biracial cabaret dancer, the nautch girl/bazaari aurat, because she seems to have brought together a number of forms of movement together. As we shall see in subsequent posts, Helen brought together the dance with the chase, and her cabaret numbers take their ecology from this convergence of cinematic motifs. More, Helen brought the ethnic/racial other into a multisensorial communication channel with a “camp” sexuality. The performativity of her identity interests me little if at all, but what I am going to suggest is that performativity, as gridded but repetitive practice, is constituted by the ensemble of movements, the mixtures of duration, that I am calling an ecology of sensation. What needs to be specified and argued concretely is the particular resonant unity that emerges in the Helen assemblage. We will develop this point in subsequent posts. I have taken this clip from the Merchant Ivory film; I have wanted to focus specifically on Helen’s dance and racial/ethnic otherness.